We all know the saying “A clear space a clear mind” and clutter builds quite easily without you realising. A document clear-out of old documents is available. At Security In Shredding we offer an excellent clear-out shredding service both on site and off site shredding is available. Paper documents take up space. 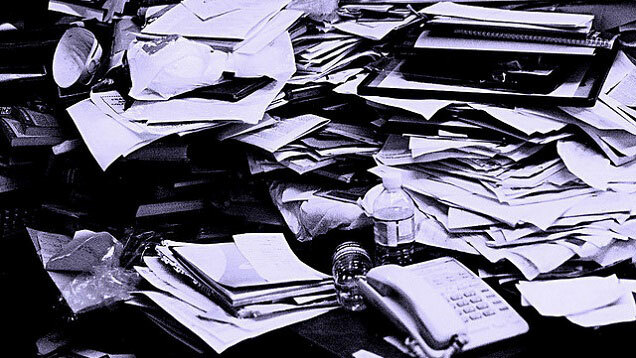 While you might only leave few documents lying around, over time these build up into large piles. This takes away space in the office that could be used for a better purpose. If the documents are in a pile this could mean that a) the documents served their purpose and no longer in use and b) its and not an organised pile. If this is the case then it is time to hire a secure shredding service. Any item left idle for an extended period of time will gather dust. Dust presents its own problems. For some people dust can cause asthma flare ups. There can be other factors that cause asthma flare ups but with a clear space will make it easier to clean the area and prevent dust from gathering. With dust comes dust mites. These bugs are microscopic to the eye and are everywhere. Not necessarily representative of a dirty office but can cause irritation to people with asthma. We receive a massive amount of documents over time. Be it brochures, newsletters, advertisements and or your own documents on top of that. Most likely these will get recycled but the documents that are left around that had a purpose and were kept as reference. After a while we can forget what was left where and newer documents get put on top of the old. There is a potential here of sensitive data getting mixed in with these documents. Chances are it won’t happen but in case there are confidential documents then hiring a on site secure shredding service will remove all your documents in a large quantity. This entry was posted in Confidential Shredding, Data Destruction, Off Site Shredding, Onsite Shredding, Paper Shredding, Recycling and tagged paper Shredding, Paper Shredding Ireland, paper shredding service, secure document destruction, Secure Shredding by Security in Shredding. Bookmark the permalink.